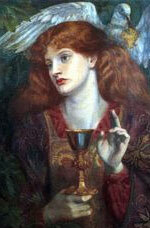 The Holy Grail has been held as an object of mystery throughout the centuries, especially within Western Society. Its origins are not fully known nor its true representation. It has become a relic of great lore. Many debate the actual physicality of the Chalis itself. As a feature of medieval legend and literature, the Holy Grail appears variously as a chalice, a cup, or a dish and sometimes as a stone or a caldron into which a bleeding lance drips. It was identified by Christians as the chalice of the Last Supper brought to England by St. Joseph of Arimathea. The development of the Grail legend has been traced in detail by cultural historians: It is a legend which first came together in the form of written romances, deriving perhaps from some pre-Christian folklore hints, in the later 12th and early 13th centuries. The connection of Joseph of Arimathea with the Grail legend dates from Robert de Boron's Joseph d'Arimathie (late 12th century) in which Joseph receives the Grail from an apparition of Jesus and sends it with his followers to Great Britain. Later writers recounted how Joseph used the Grail to catch Christ's blood while interring him and that in Britain he founded a line of guardians to keep it safe. The early Grail romances centered on Percival and were woven into the more general Arthurian fabric. The Grail plays a different role everywhere it appears, but in most versions of the legend the hero must prove himself worthy to be in its presence. In the early tales, Percival's immaturity prevents him from fulfilling his destiny when he first encounters the Grail, and he must grow spiritually and mentally before he can locate it again. In later tellings, the Grail is a symbol of God's grace, available to all but only fully realized by those who prepare themselves spiritually, like the saintly Galahad (King Aurthour). 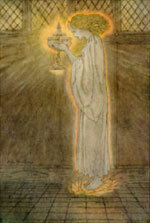 King Aurthur is said to be one of the 3 achievers of the Holy Grail in Arthurian legend. The Grail has also been treated in works of non-fiction, which frequently connect it to conspiracy theories and esoteric traditions. Dan Brown's bestselling novel 'The Da Vinci Code', is based on the idea that the real Grail is not a cup but the womb and later the earthly remains of Mary Magdalene (again cast as Jesus' wife), plus a set of ancient documents telling the "true" story of Jesus, his teachings and descendants. In Brown's novel, it is hinted that the Grail was long buried below Rosslyn Chapel just like one tradition claims, but in recent decades its guardians had it relocated to a secret chamber below the Inverted Pyramid in front of the Louvre Museum. Of course, the latter location has never been mentioned in real Grail lore. Yet such was the public interest in even a fictionalized Grail that the museum soon had to rope off the exact location mentioned by Brown, lest visitors inflict any damage in a more or less serious attempt to access the supposed hidden chamber.